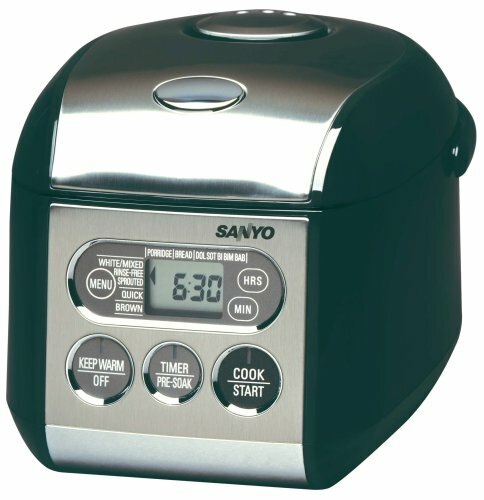 Then I came across the Sanyo ECJ-S35S 3.5 cup Rice Cooker. Now it's like: how did I ever live without one? It makes Perfect Rice! Every time. As good as or better than a Sushi Bar or Chinese Restaurant. Brown Rice from the health food store or white Sushi Rice from Jewel comes out perfectly cooked every single time. It has a "keep warm" function that keeps the rice at a perfect serving temperature for hours. I let it sit for 10 hours once and the rice was still near perfect. Cleaning is a breeze as rice does not stick to the titanium coated pot and the inner lid pops off in an instant for easy cleaning. The included accessories are just a 1 Japanese Cup measuring cup (about 7/8 USA cup), a specially designed Spatula for scooping out the rice and a small cookbook. The only things that aren't absolutely perfect about this Rice Cooker is that the solid plastic feet allow it to slide backwards when you push the buttons on the front and the "End of Cooking" chime is on the quiet side. I own two other rice cookers and this is the best and my favorite. I can not wait to make bread in it! It is a small rice cooker that is perfect for a small family. Rice is nice, but Bread is Best!! Woo baby!! Now I am making bread, from scratch- every single night before I go to bed(or setting my alarm really early) because my family *loves* the bread this thing makes!! It's amazing really! I make a loaf and it is gone before the day is over, guaranteed- it is so yummy and chewy. The crust is just crusty-perfect on the outside and the inside is soft and chewy. The kids love it for breakfast instead of toast- just straight out of the rice cooker with a little butter and homemade strawberry jam. My husband makes himself ham and cheese panini sandwiches which are the best ever with slices of the stuff. Remove the milk from heat once it starts bubbling. Throw it all in the food processor and process until it turns into a ball (use the dough blade attachment-- its the plastic thing-a-ma-bob without a real cutting blade). If it doesn't ball up right away, continue to process and slowly add a little flour until it does. It should eventually be easy to pick up out of the food processor and play with. Play with the dough for a while. This is technically called kneading. I like to make dinosaurs and then squash them together like they are fighting. When you've had enough play time, pat it into a ball and throw that baby in your rice cooker. Select bread mode. It will beep after 40 minutes at which point you can/should punch it down if you did it right and they yeast thing worked properly. It will beep again after another 40 minutes and then you flip the lo9af over to brown on the other side for the remaining 10 minutes. The awesome thing about this is even if the yeast doesn't do it's thing, the bread is dense but still yummy as can be because it is nice and steamy in there. Yum! Try it, you'll love it!! Oh, and it makes great rice... AND you can make bread pudding... but that's all in the manual...so, uh, read the manual after you buy this. I bought an earlier version of this rice cooker a couple of years ago and have been delighted with it. Based on my recommendation, two friends have bought them. And I myself just bought a third one (the new version) as a present for another friend. Nothing to add to the positive comments from others in this forum. We haven't checked out the bread-making capability yet, but the new one makes rice and steel-cut oatmeal just as well as the old one. My one small complaint is that it is difficult to clean next to the hinge. But that's minor, compared to the cooker's overall quality and convenience.